A family of five lost their home after a fire, suspected to be electrical in origin, destroyed their Number 78 Village, Corentyne house last Thursday. According to Shaklima Roy, 30, she resided in the four-bedroom concrete and wooden house with her husband and their three children. Roy explained that around midday on Thurs-day she was home cooking when she heard a spark coming from the upper flat of the house. “Then I hear something go off and when I go up I see the middle wall catch fire where the bulb went,” she said. Roy added that she then rushed downstairs and got water to put out the fire. “I thought I coulda control the fire but when I go back the fire start to blaze up on them blinds after and it start move from the middle wall and come around,” she added. Roy noted at this point residents of the area noticed the blaze and rushed over to assist her. However, after they were unable to help, they urged her to evacuate the house with two of her children, who were home at the time. “Between 20 minutes, the whole house in fire and the firetruck come close to 20 minutes after the whole house went in flames,” the woman noted. “We na got to save nothing, no clothes, no money, no appliances, nothing,” she said. The family claimed that had the firetruck arrived earlier, the rear portion of the house could have been saved. 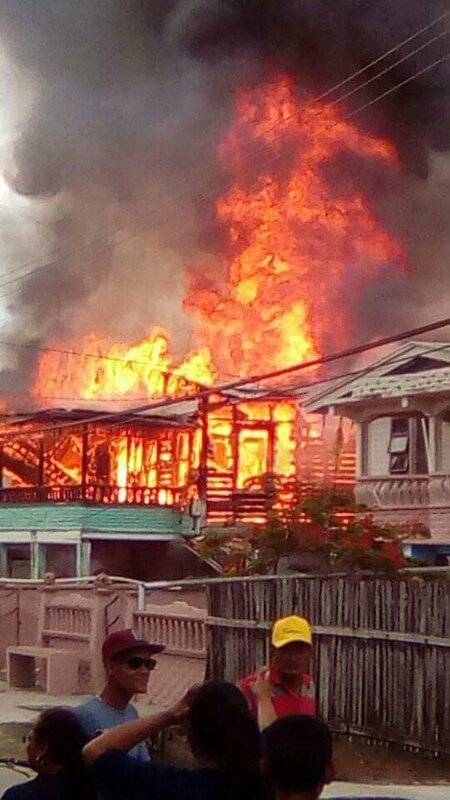 Residents also stated that due to the blaze, nearby houses were scorched. “The firetruck take too long and when them come them had half tank water, neighbours had to assist for them other house na burn down too. Me house coulda been save if them been come earlier, only the front part would a burn down,” the devastated woman said. The family is presently being given shelter at a neighbour’s residence. Roy stated that her husband operates a food stall at the market and she would cook and supply it.